I like reading about bad people in fiction. And, lest we jump to conclusions, it's not because I'm a bad person myself (at least not in the torture or kill people kind of way; no, the sins in which I dabble are much more pedestrian than that), but it's because I like peering into those dark little corners of their brains. The most frightening and fascinating realization I come to in such novels is that, really, they're much more like me than I care to admit. Take Pulp Fiction, for example, which may be my favorite movie of all time. Sure, you've got some of the old ultraviolence, but what's really chilling is to see how it's part of the average work day for Jules and Vincent. Their days are filled with conversations both philosophical and mundane, punctuated by acts of violence that they accept as part of how their world works. When we think of men who can kill, we think of monsters, depraved beings who have no moral compass, an inability to reason. While that is certainly sometimes the case, sometimes we find that--behind the monster--there is just a man, one who knows that what he is doing is wrong, but does it anyway: for money, for love, for power. 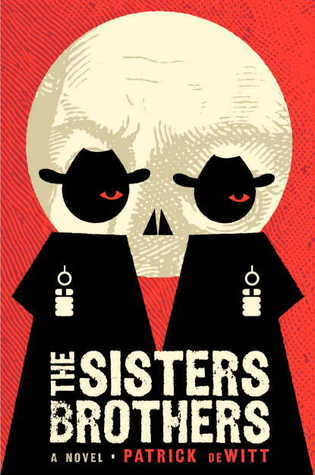 And what worked for Pulp Fiction is what works for The Sisters Brothers. Charlie and Eli Sisters are two of the most feared assassins in the West, working for a shadowy figure known only as "The Commodore." Charlie, the older brother, is ruthless and power hungry, while his brother, Eli, is a sensitive sort who is prone to violence when he becomes enraged--a tool often used by Charlie to his advantage. Even in adulthood, Eli is relegated to the archetypal role of the younger brother, haplessly following and obeying his older brother, while occasionally challenging Charlie just to see how far he can be pushed. The brothers are sent by The Commodore on an errand to kill Hermann Kermit Warm, a prospector who has crossed The Commodore in ways unknown to the brothers. Not that it matters as their job is to kill and not ask questions. The journey there provides the brothers with adequate time to be attacked by a bear, run into a backwoods witch, visit a brothel, and encounter characters curious and strange. As the men travel, we see them banter back and forth, every bit true siblings, alternately needling each other's quirks and weaknesses and then engaging in profound conversations about their beliefs and shared history. The dialogue between the brothers is the real treat of the novel--witty and peculiarly formal (think Charles Portis's characters as portrayed in the Coen version of True Grit). As he longs for love, worries about his weight, discovers the joys of dental hygiene, and wrestles with his disdain and admiration for his one-eyed, cantankerous horse, Tub, Eli Sisters is the more relatable of the two brothers. However, before one can become too attached to either character, a scene of needless and wanton violence reminds us that both of these men are killers and, for all the contemplation of human nature the two engage in, it proves as difficult to put down a gun as it is to pick one up.